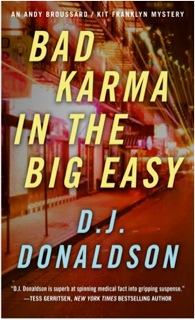 I was intrigued by the prospect of reading Bad Karma in the Big Easy by D.J. Donaldson since it deals with post-Katrina New Orleans. My family also survived Katrina, although from about 200 miles away. The setting of the story is the time immediately following Hurricane Katrina in August, 2005. Chief Medical Examiner Andy Broussard is tired and overworked in the temporary morgue. He is perplexed by the bodies of three women who were found naked in the lower Ninth Ward, the scene of much of Katrina’s destruction. There are unusual similarities – the primary one being that these women were murdered. Kit Franklin, forensic psychologist, is drawn into the case. There are many unusual twists and turns in this mystery. People are not who they seem to be and the killer surprises everyone. Although part of a series, Bad Karma in the Big Easy reads just as well as a stand-alone novel. Connections to prior books only bear a brief mention and are not crucial to this story. The book is an enjoyable read, although some of the situations are quite horrifying and reluctantly believable. The characters all have depth and I was sympathetic to both Kit and Andy. I give Bad Karma 4 stars. It’s a good mystery with a satisfying ending. I highly recommend it.